In the German city of Krausnick, not far from where the Berlin Wall once stood, a former airship hangar houses Tropical Islands, a 700,000-square-foot indoor waterpark resort with a sandy beach, lagoon, spa, fine dining and a hotel. Regardless of the weather this megaresort is open 24/7, through the use of some high-tech roofing. Ocean Dome in Miyazaki, Japan, is known as the world’s largest indoor waterpark. It’s the size of three football fields, or 322,700 square feet, and features a fully retractable roof that is kept open when warm weather permits. One of the largest shopping malls in the world includes one of largest indoor waterparks, the 217,000-square-foot World Waterpark at the West Edmonton Mall in Edmonton, Alberta, Canada. When there’s a blizzard outside, the glass roof allows natural light through and makes the 86 degrees inside seem tropical. Thanks to advanced roofing technology, larger and larger indoor facilities now are becoming possible. For example, today a 7-acre outdoor waterpark can be easily converted into a 7-acre indoor waterpark with no supporting posts. This trend makes it possible for outdoor venues to expand their peak season from 100 days to 365 days a year, and the ability to let in the light and keep out the weather is ideal for indoor waterparks. Using a transparent roofing system, resort developers can create an economical indoor island paradise open to the sky all year long — a big attraction for people who live in areas where it’s too cold, hot or rainy. What’s more, the new high-tech structures often are less costly than traditional materials. If you’re looking to cover a large space, there are currently four ways to do it. Open-air buildings can be all glazed or in-filled with other materials. These buildings are perfect for indoor waterparks, pool enclosures, restaurant patios or shopping mall concourses where the building owner wants to bring the outdoors in. 2. Thin shell concrete domes. Now there are dozens of dome structures — designed for industrial and commercial use — in existence around the globe. These include churches, schools and homes. Large spaces can be sliced into the dome, letting in a maximum amount of light. Recently, the Holiday Inn Express in Toledo-Maumee, Ohio, opened its indoor waterpark using the dome structure. With no support posts, the waterpark layout is unencumbered because water rides and slides hang from the ceiling of the dome. 3. Polycarbonate grid with Texlon Foiltec. 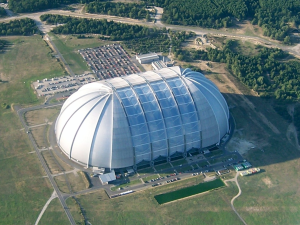 Texlon Inc of Cohoes, N.Y., built the Biomes at Cornwall, England, similar to the geodesic domes made famous by futurist Buckminster Fuller. Foiltec uses a polycarbonate grid system with several layers of Texlon transparent materials that can withstand great snow and wind loads. Polycarbonate grid waterpark projects include the 42,000-square-foot, pyramid-shaped indoor waterpark at Massanutten Ski Resort in McGaheysville, Va.; the 68,000-square-foot outdoor wave pool at Wilderness Resort in Wisconsin Dells, Wis., which was brought indoors using Texlon; and the waterpark expansion at Kalahari Resort in Sandusky, Ohio. Movable roofing systems are perhaps most popular in sports arena design. Reliant Stadium in Houston and Miller Park in Milwaukee are two examples. Movable roofs and walls make it possible to convert outdoor waterparks and amusement parks into flexible outdoor-indoor facilities that can generate revenue all year long, regardless of weather.